Before jumping to How to make the windows gadget, lets see where the default Gadgets used by windows are present. We can always use those inbuilt gadgets as reference to make our windows gadget. The default gadgets on Windows 7 are located in the drive (typically C:) you installed Windows, Under "Program Files\Windows Sidebar\Gadgets" folder, and any shared or additional gadgets in "Program Files\Windows Sidebar\Shared Gadgets". We can create gadgets in any of these folder provided we have Administrative Privileges to the system. If not we can place our apps in %localappdata%\Microsoft\Windows Sidebar\Gadgets, which usually expands to C:\users\<username>\AppData\Local\Microsoft\Windows Sidebar\Gadgets. Note: The AppData folder might be a hidden folder. Make sure to enable show hidden folders to view the folder. Lets start making a simple gadget that counts down given the number of seconds to countdown to. That is the final output, and now lets start to make a new windows gadget. If you just want to skip the entire shebang and just get the files and figure out yourself, goto the end of this post and get the zip file for the gadget folder. Use one of the folders above, and create a new folder. Countdown.gadget. Create a gadget.xml file inside this new folder. (If you see the windows examples, you can see this file is inside the en-US folder, this is for gadgets that support multiple languages.). For simplicity let us just ignore the language support. Paste the following into the XML file and save it in UTF-8 Encoding. The above code is almost self explanatory, but I will explain some of the important parts of it. base : The src attribute deteremines the main HTML file that is shown when the widget is added to the desktop. works fine - thanks for the sample ! Thank you for this article and sample. 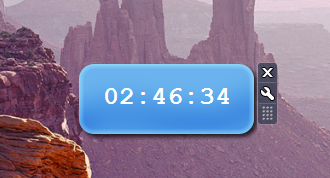 Coincidentally this is exactly what I was looking for in a gadget (countdown/timer). I have it working. Love it for it's simplicity. 3. Add a user input var for the message on expiry. (eg. Eggs are cooked !). I downloaded this example gadget on windows 7 system but don't see it on the list of gadgets when I right click and hit gadgets button. I can see all of the other standard gadgets but not any custom created gadgets. Where did you put the Gadget folder? Can you please tell where you have extracted the gadget zip file to ? still does not show up .. Thanks Just tested with C:\Program FilesWindows Sidebar\Gadgets and it works ..
May be you should put it as part of the article. Thanks again ... Nice article ! !